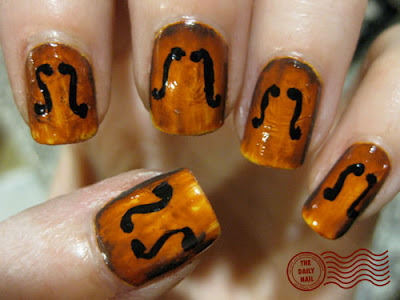 Today's manicure was inspired by violins/fiddles/guitars, etc. I came up with the technique of layering several colors, and then using a big fluffy brush that was wet with acetone and brushing lightly, until the colors from underneath started to show. I'm fairly pleased with how it turned out, it gave the effect of aged, varnished wood, which is precisely what I was going for. :-P I'll probably try this again at some point with crazier colors. I used 2 coats of American Apparel Manila as a base, then 2 coats of American Apparel Pinto, then two coats of Sally Hansen Leather Frost, which I got at the Dollar Tree. Topped this off with 1 coat of Seche Vite top coat, let it dry, then proceeded to brush off the color with the acetone remover. For the F holes, I used American Apparel Hassid. Topped everything off with Seche Vite top coat. I wish I could paint my nails everyday like you do! My nails are currently pretty yellow because of all my nail painting, so I'm taking a mini-hiatus right now. Its driving me nuts to see my nails clear and plain, so Im very thankful for blogs like these. Lol. WOW!!! This is incredible! You are so creative. How on earth do you come up with these techniques and ideas? They are marvelous! I mean seriously- you actually figured out a way to make nail polish look like the wood on a Stradivarius! How freakin' cool is that? You are so SUPER talented! This is an interesting technique! I think I might have to try it some time :D. Can't wait to see what it looks like with some bright colours involved! OMG I love violins. This is so cool. wow-can't believe how realistic that looks! awesome job!! OK... so these are the COOLEST nails I've EVER seen!!! I really do love these. I really like how you're coming out with so many inventive polish techniques!!! Almost a cats eye/gem quality to the striations, at least on my monitor. I'd love to see a tutorial for this!